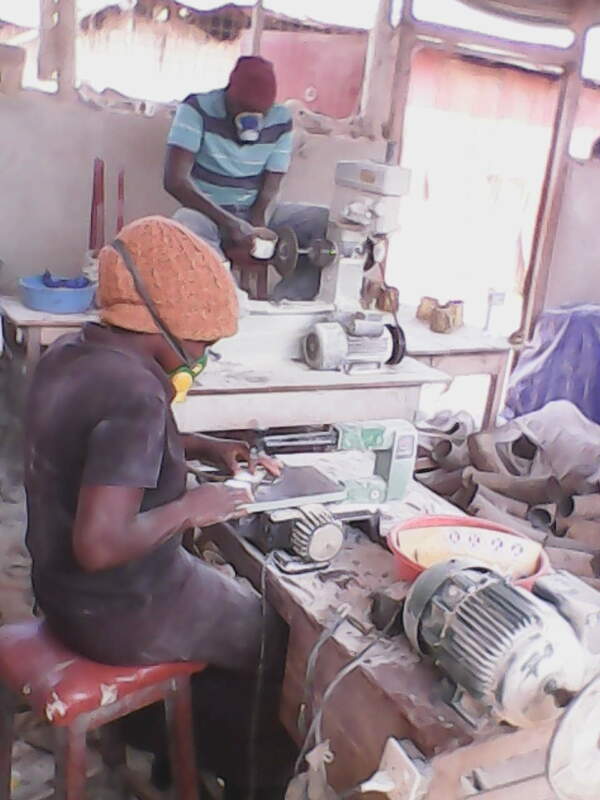 Our Ugandan journalist, Muheebwa Hillary, tells us of another initiative as part of CALM Africa’s Outreach work – youth apprenticeships in craft-making. The slum area of Kalerwe has one of the highest crime rates in Kampala city. Youth here spend day time in makeshift dingy houses chewing ghat, smoking marijuana, inhaling petrol or dosing off. When darkness falls, they waylay people snatching their possessions, break into houses and take off with any valuable they pounce upon. With poverty levels high and literacy levels low, unemployment rate raises higher. The area is a reclaimed swamp that is prone to flooding whenever it rains. Within this neighborhood is one of the city’s abattoirs, where hundreds of cows are slaughtered daily. Most of these cows are brought in on trucks from upcountry. After slaughtering these animals, one of the parts that used to be thrown away or burnt were horns. But they are no longer thrown away; they are now a raw material. Just across the road a group of men and women are at work. Some are boiling the horns. Others are slicing them. And inside an improvised ‘warehouse’, others are crafting them. Welcome to Horn Products Uganda Limited. “We can craft anything out of horns, especially if you give us a design,” says Charles Ggala, the Programs Director. Some of the items already sold and on display include; bangles, coasters, ear rings, egg holders, finger rings, horn bead necklaces, key holders, napkins, polished horns, shoe horns, toggles, tumblers and vases. Most of the youth who work at Horn Products are from the neighborhood. “We pick youth who would like to learn some income earning skills. This helps to keep them off the peer influence into bad habits,” adds Charles. “We give them lunch, transport cost and some money regularly to motivate them. The youth are kept busy from morning till evening, with a one hour lunch break in between. CALM Africa does frequently recommend youths to be taken up for orientation and training in horn crafting at Horn Products Uganda Limited. CALM Africa also provides counseling services to these youths, giving them wealth creation strategies and self-sustaining tricks. With the training and assistance, the youth gain skills while earning some little money for self sustenance. At the time of our visit, there were about 20 youths actively involved in this crafts industry. “Some leave after they have acquired skills. About five of our trainees that have left now have their own workshops nearby, making horn by-products” says the Program Director. “We would be willing to take in more youth for training, but we have to be realistic and take in numbers that we can adequately maintain within our production costs,” Charles reveals. A pair of horns costs on average Shs 18000, (average of $6) and in a day they can use about 50 pairs. “Getting horns is an expensive venture; we now get most of our horns from our collecting centres in Mbarara in western Uganda, and in Arua and Gulu from the north. We get other horns from as far as Democratic Republic of Congo,” Charles explains. “We need long horns, preferably those from local breed cattle, but most farmers are now into cross breeding with exotic breeds. These have short horns which are not viable for our products”. He adds. Most of the products are sold directly to customers who send in orders from abroad, including Europe and America. They also have a stall in Dubai that has been operational for the last 5 years. “The immigration personnel usually disrupt our shipments making us pour our packages onto the floor, thinking we are smuggling elephant husks because of the symmetrical resemblance. They always probe into whether we are not poaching the animals. Yet these are horns from cows slaughtered at abattoirs,” Charles emphasizes. The leftover cuttings and dust are burnt and the ash mixed with other ingredients to make animal feeds and soil manure. “These bones are rich in calcium; mixed with other feeds they make mineral rich feeds for chicken and animals. The peelings are also used for garden mulching,” explains James. Plans are underway to expand the production facility, and craft out more by-products. “We are researching on how to make some medicinal products, and making car window glasses out of horns. That way we will get to utilize the horn more and engage with more youth,” James and Charles concur.